500,000 products now purchasable directly on Wanelo with just one tap. 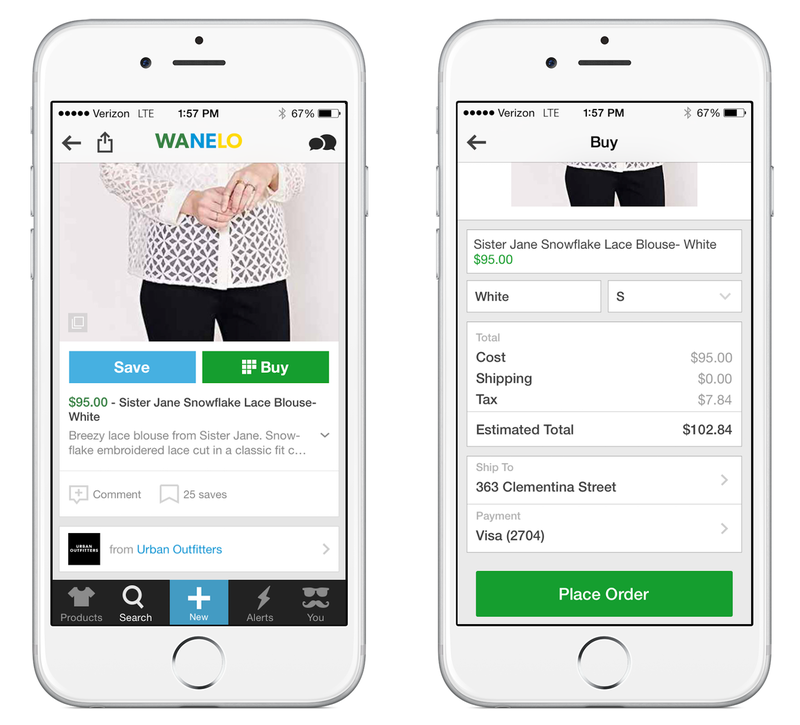 "Buy on Wanelo" allows users to purchase items directly from the app, without being redirected to retailers’ ecommerce sites. “With 'Buy on Wanelo', we’re giving users the frictionless checkout experience they’ve been wanting, and brands are eager to participate because they simply want to sell." Wanelo (http://www.wanelo.com), a digital mall curated by millions of people to discover and buy unique products online, today announced the launch of "Buy on Wanelo," a feature that allows users for the first time ever to seamlessly purchase items from within the app. "Buy on Wanelo" offers the millions of people who shop on Wanelo an easy way to instantly purchase items they love directly from brands’ product pages. Shoppers will no longer be redirected to the retailers’ ecommerce sites to complete purchases, nor required to enter credit card information for each checkout. With "Buy on Wanelo," 500,000 products are now available for purchase. Shoppers on Wanelo will see a different “Buy” button on these products from stores who have partnered with the company to enable "Buy on Wanelo." Shoppers simply tap the “Buy” button shown under the product, choose their size and color options, and tap “Place Order” to complete the purchase, which Wanelo will then process. Wanelo’s traffic is 90 percent on mobile, and this summer, the company conducted early tests for "Buy on Wanelo" and found in-app conversions were three times higher than standard Wanelo mobile conversions. Today, 200 brands ranging from large retailers to unique independent stores are live with "Buy on Wanelo": Urban Outfitters, Nasty Gal, Nicole Miller, Torn by Ronny Kobo, House of Harlow 1960, Leif Shop, Rag & Bone, River Island, ModCloth, Azalea, Seldom Seen and Zara Terez. More brands will be joining in the coming months. "We believe in going where our customers are, and it's exciting to see Wanelo become an important and fast growing community on social with nearly 3 million followers," said Jim Davis, Director of Interactive Marketing at Urban Outfitters. "As a brand that is always on the forefront of engaging with consumers who yearn for creativity and authenticity, joining 'Buy on Wanelo' allows us to better reach our shopper who wants to buy right at the point of discovery." More information on "Buy on Wanelo" can be found here. Launched in 2012, Wanelo (“wah-nee-loh,” from Want, Need, Love) is a digital mall curated by millions of people, with 20M products from over 350,000 stores. It’s a place where shoppers can follow and search all of their favorite stores in one place and discover the most amazing products in the universe. 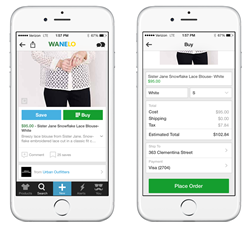 With a 100% focus on shopping, Wanelo is the leading platform for retail used by brands such as Nordstrom, lululemon, Sephora and unique independent shops such as Pixie Market and Koromiko. Wanelo is available on web, iOS and Android devices. The company was founded by Deena Varshavskaya and is headquartered in San Francisco. For more information, visit: http://www.wanelo.com/about.